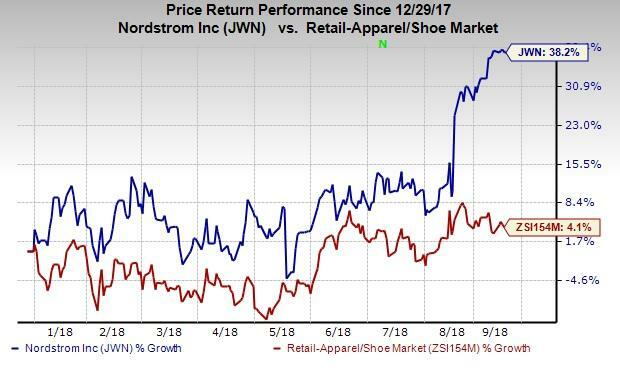 Nordstrom, Inc. JWN is scoring high among investors, courtesy of its solid omni-channel capabilities and efforts to keep pace with evolving retail trends. Also, the company’s significant progress on customer-based strategy is commendable. Notably, these factors are acting as propellants, with the company’s shares surging 38.2% year to date, outperforming the industry’s gain of a nominal 4.1%. Analysts are steadily growing bullish on the company’s prospects as is evident from solid upward revision in its earnings estimates. The Zacks Consensus Estimate of $ 3.57 for fiscal 2018 and $ 3.70 for fiscal 2019 has moved up 3.8% and 3.9%, respectively, in the last 30 days. Upward estimate revisions reflect management’s encouraging view for fiscal 2018. Management envisions fiscal 2018 earnings per share of 3.50-$ 3.65, up from the $ 3.35-$ 3.55 range guided earlier. Impressively, this leading fashion retailer has delivered top and bottom-line beat in second-quarter fiscal 2018, marking the eighth earnings beat in nine quarters and fourth positive sales surprise in five quarters. Also, stellar first-half results have led management to raise its guidance for fiscal 2018. Nordstrom has been aggressively focusing on store-expansion strategy to gain market share. The company has successfully completed its planned full-line store expansion in Canada by opening six stores in the country. Overall, Nordstrom envisions a $ 1 billion sales opportunity from its expansion in Canada by 2020, including six planned full-line stores and 15 Rack stores. It remains on track to open three new stores in fall 2018. Launching of Nordstrom Local, the company’s first modern retailing concept store, which does not stock merchandise, clearly demonstrates that the company runs in coherence with the evolving retail industry. It is quite different from the traditional retail concept, a neighborhood store, where the company's services are easily available in a centralized location. These neighborhood hubs form part of the company’s local market strategy to offer a seamless experience along “buy online, pickup in store”, alterations and personal styling services. Nordstrom also remains on track to attain its long-term growth targets. Notably, management is making amendments to its operating model in response to the constant slowdown in mall traffic resulting from customers’ shift to online shopping. Moreover, it is focused on advancing in the technology space by boosting e-commerce and digital networks, and improving its supply-chain channels and marketing efforts. Also, the company intends to strike a balance between its sales and expense growth. Despite these positives, Nordstrom’s higher cost of sales, and related buying and occupancy costs as well as SG&A expenses are weighing on margins. This might hurt the company’s overall profitability in the near term. Nevertheless, we believe that robust and long-term initiatives undertaken by the company will help build a healthy relationship with customers, hence positioning it well for growth. Boot Barn Holdings, Inc. BOOT has an impressive long-term earnings growth rate of 23%. You can see the complete list of today’s Zacks #1 Rank (Strong Buy) stocks here. DSW Inc. DSW has delivered an average positive earnings surprise of 17% in the last four quarters. It also has an expected long-term earnings growth rate of 9%. Zumiez Inc. ZUMZ has pulled off an average positive earnings surprise of 9.6% in the trailing four quarters.